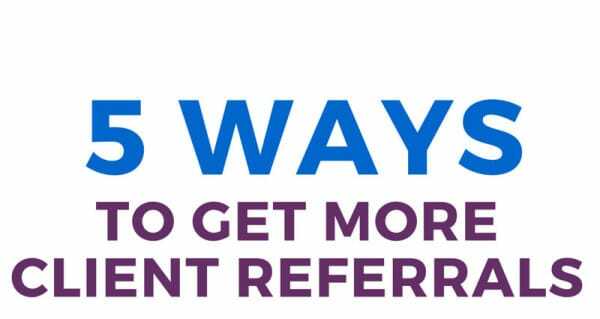 Getting client referrals is one of the best ways to build your business – that way people get recommendations from people they trust and it makes your life easier. But if you’re going to get referrals, you need a great relationship with your clients. The infographic below outlines five methods that keep a stream of clients coming to my door. I like that you mentioned greetings a couple times per year, too. I like the idea of sending a handwritten thank you card… for instance, I got one in the mail today from a client. And it stood out to me so much, that, well, I’m telling you about it right now! True, Brent. Real mail has become a differentiator, for sure. Great infographic! I am preparing to go into full time freelancing, and gathering all the information I can get from people who have been doing it for quite some time. Now I know what to do to get clients marketing my business to their friends and networks. Glad you found this useful, Patrick. Getting referral clients is really very awesome because it will not cost you anything to get them i mean, it will all come on auto pilot. However, you need to do your first underground work very well before you can get this and this is by ensuring you satisfy your initial clients. People will only refer their friends to you if they were happy with your services. Agreed, Theodore. Keeping your current clients happy will ensure that they want to refer you to others.